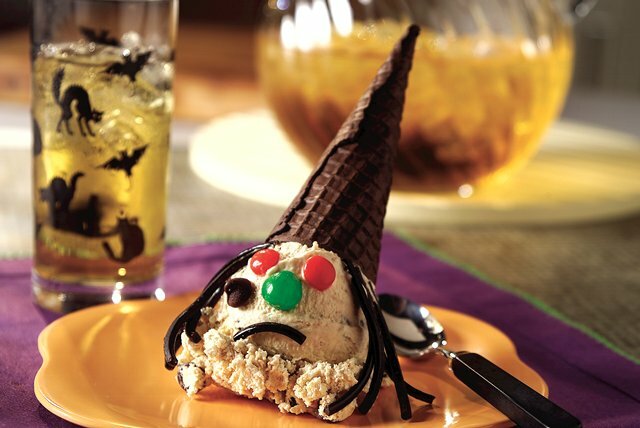 A sugar cone hat and hair made from black string licorice helps transform a cheesecake-style dessert into a real Halloween hair-raiser. Add whipped topping; beat on low speed 30 seconds or until well blended. Gently stir in Crumb Mixture and chocolate chips. Freeze 6 hours or overnight until firm. Let stand at room temperature 10 to 15 minutes before serving. To serve, scoop frozen dessert onto each of 12 dessert plates with an ice cream scoop; top each with chocolate cone for the witch's hat. Decorate with candies as desired to create the witches' faces. Children will get a thrill from these special Halloween treats. Serving it in individual cups makes it easy to monitor portion size.